Running a business is a rewarding and exciting experience that can make it an absolute pleasure to go to work… when things are going well. When you find yourself in a situation that you would rather not be involved in, like a dispute with a client or a difficult time with a team member, having a business policy to fall back on can really help. 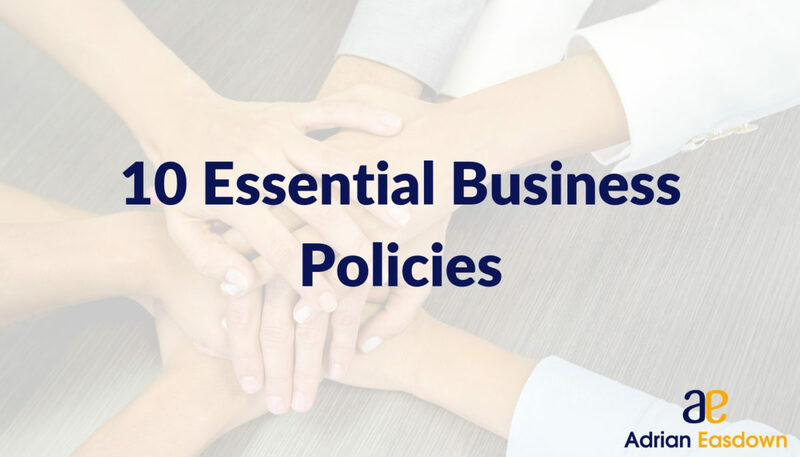 I regularly get asked what are the essential policies that can ensure the smooth running of a business, and in this article I’m sharing the ten most important ones with you. Our code of conduct policy is the core to how we want our team to interact with each other, and with clients that stay with us. It covers items like types of language to avoid through to what performance we expect of our team in their daily tasks. Having a document like this means that we have a uniform approach to our interactions with guests and we avoid any issues we may have with how our team carry out their duties. This policy goes deeper than our code of conduct policy, and is specifically about anti-discrimination and harassment. Having this policy in place for our team and our guests means that we have a position if we see anything that is considered harassment, and we have steps available to deal with them. We are a zero-tolerance business when it comes to discrimination and harassment, and your business should be too. While a no smoking policy is something that is not new, it is one thing we have across all our parks. We adopted this policy for our accommodation businesses for two main reasons. The first was due to littering – we got pretty fed up with cleaning up cigarette butts left across the park. The second is due to being a primarily family focused park. We have tons of kids running around the park and felt that smoking created an unsafe environment for them. Just like our smoking policy, we have developed a drug and alcohol policy that is in place for both our guests and for our employees. This policy covers the steps our team members can take in asking a guest to leave the park should we suspect they are under the influence of drugs or intoxicated on alcohol. As our team members are responsible for the clients we have on site, ensuring they are in a fit state to manage their duties is essential, not to mention the illegal aspect of drugs in life and the workplace. We are a business that embraces social media, and we encourage our staff to be participants on our social media accounts. Our policy provides guidelines to our staff for interacting on our social media profiles and what kind of details we are happy having shared. We also ensure that there is a proper process in place in our policy should there be something negative on one of our platforms, and what steps are needed to deal with those situations. We have a strong bond with our staff and like to operate our business so that everyone is part of the success we experience. I make sure that all the staff know my door is always open, and that they can come to me with any issues relating to the success of their roles in the business. This policy has allowed us to be the success we are today, and means that our staff have a high satisfaction with their roles and feel like they are part of the success of the park. The health and safety of your team and your guests is a critical policy that all accommodation businesses must have. This policy will be largely dictated by legislation, such as how someone works with electricity, through to break periods your staff are eligible for. When dealing with the public your insurer will also provide a list of items to be included; for example, having a well-documented fire evacuation process for your guests through to the spacing of your sites to ensure easy access around the park at all times. Making sure that your business has policies in place that cover leave, sick pay, superannuation payments, salary information, hiring processes, job descriptions and termination process is fundamental to running a successful business. Even if you are only a small operation, HR policies remove any ambiguity for you and your staff and make employee interactions easier to deal with. Government departments can provide you with all the information that should make up your HR policies and ensure that your business is operating in line with employee rights, and your rights as a business owner. This policy is something that I have added to my parks and one I am passionate about. When dealing with the guests in our parks, or when you walk by them, or if you see them in town – say hello. This might not be something that we have stuck to the tea-room wall, or something written down in concrete, but it is the one that has given our parks the leading edge and brought visitors back, time and time again. IF you implement these policies in your business you can ensure the smooth running of your business and make it a winning place for your guests to visit.